Der MTLS-1G14 ist ein amerikanischer premium leichter Panzer der Stufe 3. Entwickelt im Auftrag Niederländisch-Ostindiens. 125 Fahrzeuge wurden von 1941 bis 1942 gebaut, jedoch nur 20 abgefordert. Niemals im Kampf eingesetzt. 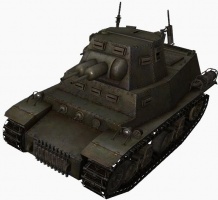 This is the only tank in the game with the double-barreled gun. 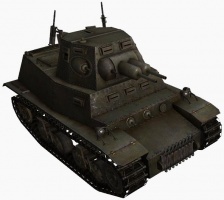 This tank has never been made available for purchase on any server. A few have been handed out through special circumstances like reward for alpha testers on NA server. Only available for sale on the Console Version. After 7 years, this vehicle spent its time as a mysterious vehicle. 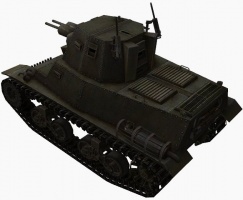 The MTLS-1G14 finally made its official debut in 1.0 marathon event for all players to earn by collecting stamps. Along with nerfed gun stats. A 4-man Dutch Tank, Model MTLS-1G14 built by the Marmon-Herrington Co, is a 42,000 pound, full track laying vehicle powered by a six cylinder, liquid-cooled, 240 horsepower engine manufactured by the Hercules Motor Corporation. The vehicle is a front drive employing a five-speed transmission with a Marmon-Herrington controlled differential drive with dual controls. The Marmon-Herrington all steel, 18 inch track uses outside guides intergrally cast in the track blocks and the suspension is a vertical volute spring type employing rubber-tired bogie wheels. The hull is made of flat plates, bolted together, varying from 1-1/2” thick on the front to 1/2" thick on the top. 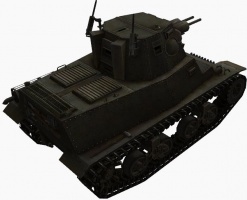 The turret has a 360 degree traverse and it mounts two 37 mm/44 cal. 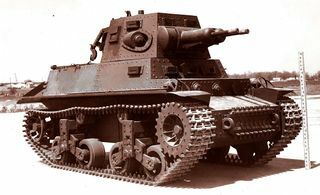 Automatic guns, one swivel mounted cal. .30 machine gun, and one cal. .30 anti-aircraft machine gun mounted on the outside of the turret. The auxiliary armament consists of three cal. .30 machine guns placed in the bow of the vehicle. Two of the guns are in fixed mounts, while the third is flexibly mounted.